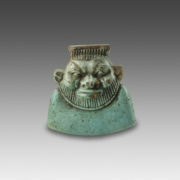 Under the right eye, the presence of a cartouche containing three imprinted hieroglyphic signs makes this small piece unusual. 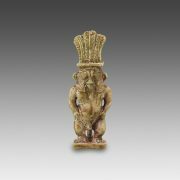 The cartouche reads Khenem-ib-Re, one of the names of Amasis, the penultimate Pharaoh of Dynasty 26. During his long and peaceful reign, Amasis endowed Egypt with great monuments and favored foreign trade, especially with areas in the Mediterranean regions (Greece, Caria and Lydia). Although he is known from Assyrian, Greek and Persian texts, the monuments bearing his name are rare because of the destruction caused by the conquest of Egypt by the Persian king Cambyses (525 B.C.). 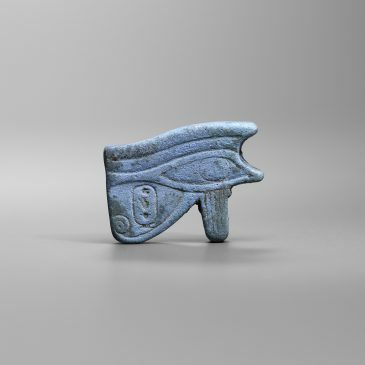 The udjat-eye was a prophylactic symbol par excellence of ancient Egypt; it appears on a great variety of objects utilized by all classes of the population. A hybrid that combines a human eye (conjunctiva, pupil and eyebrow) and markings that adorn the eyes of a hawk, this amulet evokes the idea of fullness and of the integrity of the reconstituted body of the deceased (an allusion to the legend of the eye of Horus, which was snatched away during the battle with Seth, and finally recovered by Thoth). 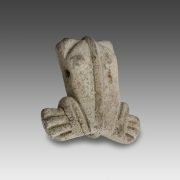 The presence of the name Amasis indicates that this piece could have been part of a collection of funerary amulets belonging to a member of the pharaoh’s court. Complete and in a good state of preservation; the surface shows a superficial wear in places and/or is covered with a grayish patina.